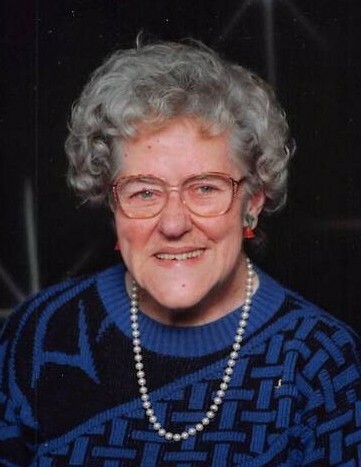 Obituary for Alma S. Rolla | Varnum Funeral Home, Inc.
Ware - Alma Rolla, 95, died on March 22, 2019 in West Brookfield. She was born February 5, 1924 in Everett, Massachusetts to Charles Robert and Ethel (Silsby) Zimmermann. She graduated from Everett High School at the age of 16 and graduated with honors from the Executive Secretarial program at Burdett College in Boston. Alma worked as a secretary and bookkeeper for the Ware Machine Company for 50 years, until they closed when she was 80 years old. She was probably one of the last people able to read and write the Chandler type of shorthand, which was being phased out when she was in high school. Alma was a member of the United Church of Ware, formerly the Ware Methodist church, since 1945. She belonged to the Ware Grange, the Massachusetts State Grange and the American Legion Auxiliary for over 70 years. She volunteered for the Council on Aging and the Ware Senior Center. In 2008 she was named the Marshall of the Memorial Day parade, in recognition of many years of community service. She always kept busy. She served as Grange secretary, Legion Auxiliary treasurer, and record keeper for a bowling league. She counted ballots in local elections, worked as a census taker and served on many committees. She had Grange friends all over the state and was well known for barbecuing chickens for many local organizations. She liked to read, take pictures and play the piano. She loved to travel and often visited her son in California. For the past nine years she lived at the Quaboag Nursing Home and liked to participate in every available activity there, especially the chime choir. Her family would like to thank the caring staff there who made Alma’s last home very enjoyable. Alma leaves her children, Margaret (Peg) Trim and her husband Glenn of Ware, Joan Cloutier and her husband Roger of West Brookfield, and David Rolla and his wife Faith of Anaheim, CA. She leaves seven grandchildren, Sharon Campsie, Kelly Trim, Steven Rice, Angela Snellbaker, Shelley Rice, Jesse Rolla, and Natalie Rolla, as well as eight great grandchildren. She was predeceased by her longtime friend Francis Cote, her great-grandson Ethan Harrison and her former husband Anthony Rolla. A Memorial Service for Alma will be held on Tuesday, April 9, at 11AM in the United Church of Ware, 49 Church St., Ware. Calling hours will be held on Monday, April 8, 2019, from 4 to 7PM in the Varnum Funeral Home, Inc., 43 East Main St., West Brookfield.